It feels like Harrogate Town have been taking one step forwards, then two back again in recent months. 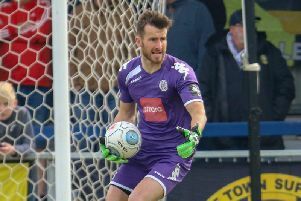 Simon Weaver’s team managed to arrest an extended run of poor form when they won at Chesterfield eight weeks ago, a result that sparked a five-match unbeaten sequence, where 13 points were garnered and just one goal conceded. That momentum then seemed to evaporate, before, following four games without a victory, they came back from a goal down to secure a crucial three points at Havant & Waterlooville the Saturday before last. All of a sudden, all appeared well with the world. That encouraging second-half performance and a return to passing football seemed to bode well for the last four matches of the season. I wrote in last week’s column that I thought that if Town won their final two home fixtures then that would be enough to cement their place in the top seven. Indeed, had they managed to beat Boreham Wood on Saturday, they’d be in a fantastic position, needing just one point from a possible nine to ensure that eighth-placed Ebbsfleet won’t be able to overtake them unless they win all of their remaining fixtures. Yet, that opportunity passed them by as they produced a disappointing, flat display against a side who came into the game just two places above the relegation zone. In fairness to Boreham Wood, they played very well for almost the whole of the 90 minutes, while Town’s performance on the day was neither here nor there. They appeared to be caught in two minds, set-up to play football, but too quick to revert to a direct ball forwards. With Jack Muldoon leading the line and Michael Woods in the number 10 role - a system that served them well in their previous game - Weaver’s men didn’t move the ball quickly or incisively enough. Instead, during the first half in particular, they looked devoid of ideas at times and hit too many hopeful balls forwards in the direction of a rather isolated Muldoon, who was being marked by three absolute giants. Town are at their best when they keep the ball on the deck, and it’s one thing punting balls towards a big target man like Mark Beck when he’s on the field, but to go long when you don’t even have the personnel up top to deal with those kind of passes seems senseless. It obviously wasn’t the game-plan, and I think it is safe to assume that, quite understandably, nerves are starting to play their part out on the pitch with so much now at stake. Saturday’s contest was frustrating to watch and, for me, ranks as one of the worst performances I’ve witnessed this term. That display wasn’t one that augurs well for the run-in, but, for the record, I still think that Town will end up in the play-offs. That said, it does looks like they’re going to limp over the line based on current form, when what they need going into the play-offs is some momentum. It should be acknowledged, however, that a lot could change, and very quickly, in the next three matches. A positive result for Town at Leyton Orient would create a completely different complexion, and, not for the first time this season, I’m going to talk about fine margins. Things are seriously tight in the battle for the play-offs, so much so, that if Town take just a point on Good Friday and Ebbsfleet lose, then that will pretty much be that, unless there is a swing of at least five goals in the last two rounds of fixtures. Indeed, if Harrogate win and Fleet lose then it’s game over for the Kent outfit. What I think is really important is that Town get something from one of their next two fixtures, out-of-form Gateshead at home on Easter Monday being the more attractive proposition. To go to Wrexham on the final day of the season needing a victory and potentially reliant on Ebbsfleet dropping points would be a horrible situation for the club to find themselves in. Here’s hoping we don’t get to that stage.